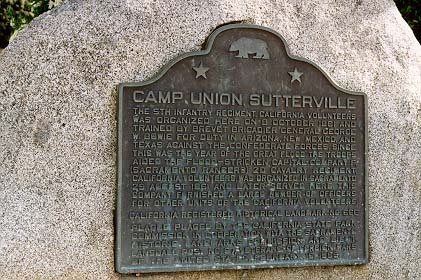 The 5th Infantry Regiment California Volunteers, was organized here on 8 October, 1861 and trained by Brevet Brigadier General George W. Bowie for duty in Arizona, New Mexico, and Texas against the Confederate forces. Since this was the year of the great flood, the troops aided the flood-stricken capital. Company F (Sacramento Rangers) 2d Cavalry Regiment, California Volunteers, was organized in Sacramento 25 August 1861 and later served here. This company furnished a large number of officers for other units of the California Volunteers. NW corner of Suttervile and Land Park Dr, Sacramento.